The Brazilian company manufactures a wide range of polymer products to the medical, cosmetics and home appliances fields. It has been in the Arab markets of Morocco, Egypt, Jordan and expanding to the Gulf. São Paulo – Brazilian company Mazzaferro is planning to increase exports from the current 30% to 50% of its net revenues in three years and the expansion to the Arab countries should help with the target. The company manufactures products based on polymer of medium, high and ultra-high performance, for the medical, cosmetics, home appliances and fishing fields. According to the company’s CEO, Cláudio Mazzaferro (picture above), this year the company began to sell fishing lines, especially lines to deep-water fishing, in the United Arab Emirates and Saudi Arabia, and monofilaments to the UAE medical field. It also has been negotiating the exports, to the UAE and Saudi Arabia, of sample products brochures and displays to the cosmetics sector. Articles for these last two fields are already on the market in Morocco, Egypt and Jordan. Mazzaferro has a department that was created with the company, which is the one of fishing products, especially lines, and another that manufactures home appliance products, technical monofilaments, monofilaments to the medical industry and sample products brochure and displays to the cosmetics sector. The company also has an integrated marketing agency specialized in the beauty sector, the 3Chology. Among the home appliance products, Mazzaferro manufactures brooms and brushes. In the technical monofilaments, the company manufactures from bristles for oral hygiene to invisible sewing threads. To the medical industry, Mazzaferro manufactures, for instance, monofilaments for surgical mesh and threads. For the cosmetics sector, it produces brochures and displays for hair coloring samples. Cláudio Mazzaferro says that the company has a tradition in exports, but that it has been making changes towards internationalization, a guideline set by the board of directors, which initially established that the foreign market should account for 30% of net revenues, a target that the company has currently reached, and that later it should aim 50%, to be achieved in three years. In the fishing department, the main products exported are sport fishing lines. The company sells from Argentina to Mexico, but the company is pushing to expand, being able to enter the United States and Europe, according to Mazzaferro. Meanwhile, the company’s other departments exports to a wide range of countries. The medical products department, for instance, sends products to around 40 countries, according to the CEO. Mazzaferro has been working in a strategy that focus on migrating from commodities to finished products. Instead of selling tons of threads, it is getting nearer the end consumer, offering greater added value and innovation branded products. “To migrate from commodity to specialization, from scale to scope economy, from domestic to global,” said the CEO about the company’s strategy. The company was founded 65 years ago by Italian immigrant Nello Mazzaferro, and it’s currently being managed by the family’s second generation. Nello began the business by importing nylon threads and invited his brother, Mario Mazzaferro, to join him. Later, they began to manufacture their own products. The expansion to other fields initiated with home appliance, with the brand Linea Bella, and followed with a diversification of products and sectors, until it reached its current level. 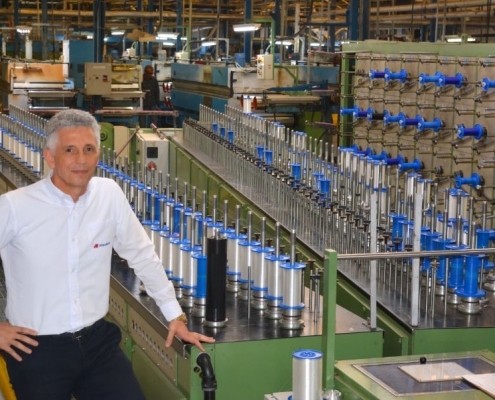 Mazzaferro is Latin America’s largest technical threads manufacturer.